Tickets Selling EXTREMELY FAST - see you & your friends there! Be sure to "Like" & "Share" above to help spread the word!! Includes No Cover Charges at all participating locations, Entertainment, tons of GREEN swag (beads, hats, etc), Great Drink Specials, Fold-Out Crawl Map, Coupon Book, and Guaranteed Good Time at 50+ locations! Includes everything with regular General Admission tickets, just at a great discount for buying 6 or more tickets together. VIP tickets include everything listed with General Admission tickets PLUS 5 free drinks or food items at participating locations. Location list coming soon. Prices will increase - buy tickets now for best price! Includes everything with regular VIP Admission tickets, just at a great discount for buying 6 or more tickets together. SPECIAL SUNDAY-ONLY PRICING NOW AVAILABLE! Are you ready for the best St Patrick's Weekend bar crawl in the history of Philadelphia? The Shamrock Crawl Presented by Miller Lite, Belle Isle Moonshine, and Arnold Palmer Spiked, a fanstastic 2-day event (yes, two tickets for the price of one!) is happening Saturday, March 16th from 12pm to 2am and Sunday, March 17th from 12:00pm - 8:00pm. Tickets can also be used for one day only. This St. Patrick's Weekend, join us as we venture through the streets of Philadelphia and celebrate our way into 50+ of Philadelphia's top locations throughout the City. This is by far the go-to event this St. Patrick's Day! BUY YOUR TICKETS NOW!!!! 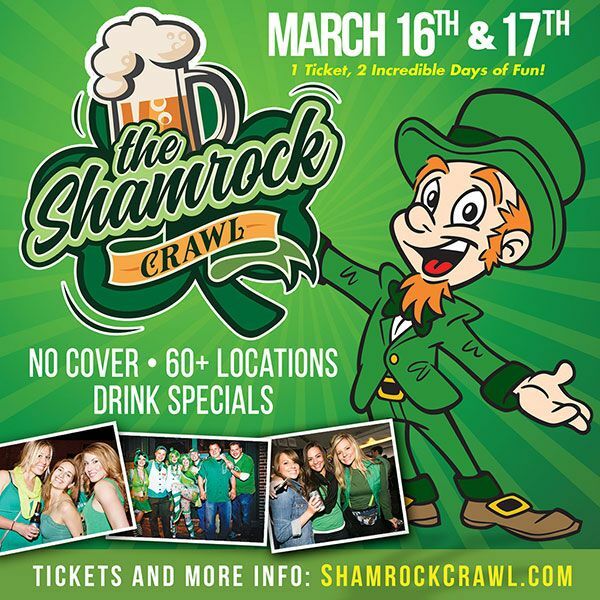 The Shamrock Crawl will give you access into 60+ locations, no cover charge all day at all locations plus great Miller Lite, Arnold Palmer Spiked & Belle Isle Moonshine specials (12-6pm) with your wristband. Stay and party all day and well into the night! If that wasn't enough everyone will be given beads at check-in along with a coupon book offering some amazing deals. You can expect multiple bead contests and different atmospheres at all locations. We have something for everyone. Just look at all the participating bars and restaurants - they are THE places to be in the city! So, gather your friends NOW. The Shamrock Crawl will sell-out like it did last year! Registration starts at noon on Saturday and ends at 6pm. Registration starts at noon on Sunday and ends at 3pm. You must be registered by the deadlines each day to participate. If you are attending both days, please keep your wristband on for Sunday! Yes, when you purchase your Shamrock Crawl ticket, you get a ticket to both Saturday AND Sunday! The best value in Philadelphia - hands down. Absolutely, positively the BEST places to be in the city of Philadelphia on St Patrick's Day! VIP Level Tickets - Grab FREE Drinks with your VIP Wristband at Top Locations! Grab Complimentary beers and drink samples with your VIP ticket! No Cover and Great Drink, Beer, & Shot Specials at 50+ Locations for Ticket Holders. Yup, pay a small fee to join The Shamrock Crawl and we have you hooked up - BIG TIME! Bar Crawl Map of all locations INCLUDING a coupon book with great offers from local hot spots and restaurants. Each bar will have live bands or DJs all day long! You can expect multiple bead contests and different atmospheres at all locations. Free Beads, glasses, hats, and other St Pat’s attire to make your crawl complete! Gather your friends & co-workers. Join us for the single greatest St Patrick's Day Bar Crawl in the history of Philadelphia! We remind you to please enjoy yourself responsibily. If at any time you feel like you need a safe ride home, please speak to a bartender or staff member for assistance. No Refunds.